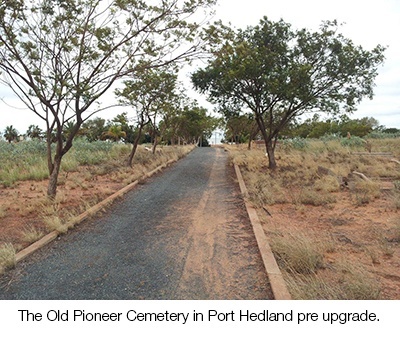 A respect for heritage and culture is needed when called upon to enhance a place called Old Pioneer Cemetery in a town such as Port Hedland with a history stretching back over 130 years. Landmark Products joined forces with multi-award-winning landscape architecture firm UDLA for the project, to manufacture and deliver a unique arbour, as part of the overall project. To ensure a meaningful outcome, the design of the distinctive arbour followed extensive archaeological surveys and facilitated community workshops at the site with local community, Aboriginal elders and relatives of the remembered. The peaceful resting place was originally initiated in 1912 and closed when the cemetery was declared full in 1968. The main goal of the $780,000 upgrade project (made possible from generous support of BHP Billiton Iron Ore and Lottery West) was to maintain an existing “sense of place” throughout the design process. The project included shade trees, extra seating, new pathways and a special memorial wall. The eye-catching arbour featured a 5m x 3m suspended, fully welded roof, with 3mm corten (rust look) panels that has been decoratively laser-cut. The pattern is based on the map of the cemetery, the shadow during the daytime forming a guide. Landmark also recently delivered a standard Peninsula (timber skillion roof) shelter to the Rockhampton Region Council for the region’s Gracemere Cemetery Ashes Garden (below).